This week I’ve been playing a great-looking, tough puzzle game called Rubek from Xigma Games. As the name suggests, it’s a game involving colored cubes. 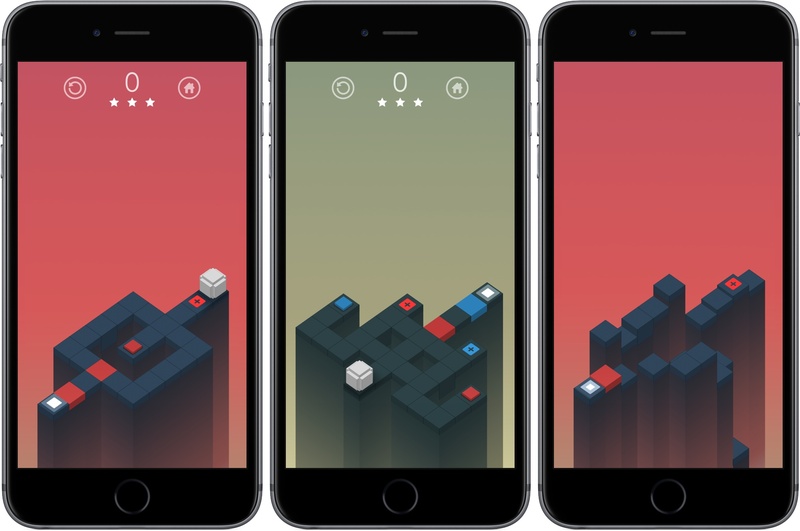 Rubek is played from a three-quarters perspective, similar to Monument Valley. You guide a white cube along a path through each puzzle to the final goal by swiping on the screen to roll the cube. The path you take is segmented into squares of different colors, including some with a small plus symbol in the center. Roll onto a colored square with a plus and the side of your cube the lands on that square changes to that color. This is where the game gets tough. You can roll any side of your cube across a dark grey square, but if you try to roll across a colored square along the path, the side of your cube that touches the square must match its color. The combination of color matching while accounting for where the six sides of your cube will land gets hard fast. Your score is determined based on the number of moves necessary to complete the puzzle. At the end of each level you get a star rating based on how many moves it took you to finish the level. Rubek has over 75 levels in total, which add new mechanics as you progress like trigger blocks that modify the puzzle’s map when you roll over them, keeping the game fresh as you play through the levels. Rubek’s settings let you turn off sounds and include a color-blind option that lets you adjust the color scheme used in the game. I’ve spent the last couple of months trying lots of different kinds of iOS games and found some great ones, but it’s nice to get back to a puzzle game, which is one of my favorite genres of all. Rubek is the sort of game you can play for 5 minutes or an hour depending on how much time you have, which I always appreciate, and it’s challenging without being frustrating. If you enjoy multidimensional puzzle games, Rubek is worth a try. Rubek is available on the App Store for $1.99.